At Airo, we watched this recent segment of ‘The Doctors’ where they discussed the potential health problems affecting men as a result of cycling. As avid cyclists, we too experienced the discomfort, numbness and pain associated with a bicycle saddle. That’s why the Airo Bike Seat™ was invented. Their advice on how to avoid potential issues included relieving pressure on the sensitive areas, rising up in the saddle and positioning the saddle in a nose down setup. These are all sensible ideas but the Airo Bike Seat™ is the real solution to saddle pressure and numbness. The Airo Bike Seat’s innovative design and Wing-Spring™ technology resulted in a patent in 2016. The saddle transmits minimal pressure to your sit bones and sensitive soft tissue, and provides superior pelvic support and spinal posture. Pain, discomfort, tissue and nerve damage are most often caused by soft tissue pressure. Each Airo Wing-Spring™ is positioned along the critical axis of support to lift your body off the pubic zone and keep you supported properly where you should be – on your sit bones. In addition, Airo absorbs impact pressure through the Wing-Spring™ and flexing horn, resulting in a smoother and more comfortable ride. A = The Airo critical axis of support required when the pelvis tilts forward into the riding position. The Airo Bike Seat’s flexible Wing-Spring is the only way to achieve this dynamic support. B = The limited axis of support by all other saddles which only support the sit bones. As the pelvis tilts forward the support is lost and discomfort and pain result. The Airo Bike Seat™ has been independently pressure mapped by bbphysio in Victoria, BC and the results are compelling. At the ideal seat setting of 1.5 degrees nose down, the Airo Bike Seat’s test results show zero pressure in the all-important perineal or pubic bone area with supported, balanced pressure being found in the sit bones, which has been greatly reduced. This was found to be the case in either the upright, neutral or aero riding position and for both male and female riders. 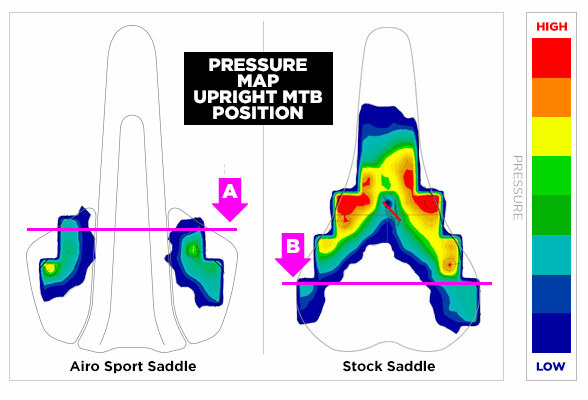 When compared, the Airo Bike Seat’s pressure mapping results are unrivalled against other saddles currently on the market today.